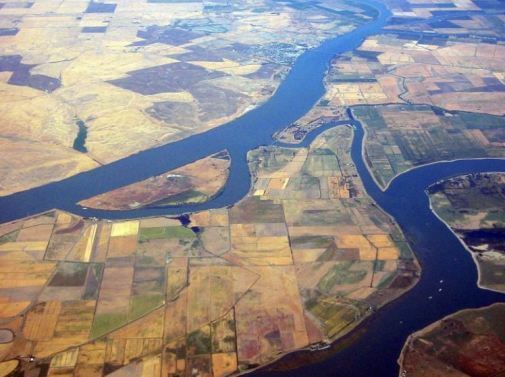 The California delta viewed from above Sherman Island, with the Sacramento River, above, and San Joaquin River, below. FRESNO, Calif. (CN) — A federal judge ordered federal regulators to reevaluate the environmental impacts of a popular California water program that allows farmers to sell water to parched southern cities and water districts during droughts. In a 133-page ruling on Feb. 15, U.S. District Judge Lawrence O’Neill declared “unlawful” parts of environmental reviews approved by the U.S. Bureau of Reclamation for a 10-year water transfer program. The plaintiffs, led by AquAlliance, include water agencies of the south, central and north delta, and the California Sportfishing Alliance. Immensely complicated, Western U.S. water laws often contain “use it or lose it” provisions that discourage rational conservation. The water transfer project was scheduled to expire in 2024. The transfer method, which has been used in California since the 1990s, involves rice farmers and other Northern California contractors voluntarily selling their federal water allocations to buyers hundreds of miles away. The Bureau of Reclamation facilitates the sales from farming districts in counties such as Butte, Colusa and Sacramento, diverting water south of the delta to buyers in Alameda, Santa Clara, Fresno and San Joaquin counties. The program allows up to 511,000 acre-feet of Sacramento Valley water to be transferred per year, depending on hydrological conditions. For perspective, the plaintiffs say a city of 100,000 uses approximately 30,000 acre-feet per year. One acre-foot of water is equal to nearly 326,000 gallons. City planners estimate that one typical single-family home uses about one acre-foot of water per year. The sellers make up for the loss of Central Valley Project water largely by pumping more groundwater or fallowing cropland. The north-south water deals are particularly common during dry years and are a longstanding piece of California’s water puzzle. Conservationists say the water deals buoy Central Valley farmers to the detriment of the delta’s ecosystem. They say the transfers come with collateral damage, including poor delta water quality, land subsidence from increased groundwater pumping and reduction of giant garter snake habitat. The snakes, one of North America’s largest native species, are endemic to California. Because of urban and agricultural sprawl, the now-rare snakes rely heavily on flooded rice fields and irrigation ditches. The plaintiffs call the transfer program a “19th century solution” to a modern problem. “These water transfers would drain both surface and groundwater resources from the Sacramento and San Joaquin River watersheds, imposing significant and irreversible threats to the people and sensitive species that rely on these water resources,” the 2015 complaint states. The bureau operates the Central Valley Project, an enormous system of dams, lakes, power plants and canals that in conjunction with the State Water Project supplies California’s 40 million residents and its booming agricultural industry with water. The valley project consists of 21 reservoirs, 11 hydropower plants and 500 miles of canals. The Bureau of Reclamation approved the current water transfer framework in 2015, claiming it would have no significant impact on the environment. But Judge O’Neill found the bureau’s environmental analysis inadequate, and that sections violated the National Environmental Protection and California Environmental Quality acts. “The FEIS/R [Final Environmental Impact Statement/Report] fails to address or otherwise explain how this information about the potential impacts of climate change can be reconciled with the ultimate conclusion that climate change impacts to the project will be less than significant,” the order states. O’Neill called the bureau’s assessment of the project’s impact on the giant garter snake “fatally unclear,” in violation of CEQA, California’s landmark environmental law. He granted in part and denied in part both parties’ motions for summary judgment. The bureau did not respond to an email request for comment Monday afternoon. The ruling, while favorable to the conservationists, does not freeze the water transfer program. Instead, O’Neill directed the parties to confer and try to settle the case before a March 16 deadline. “The court has provided ample and specific direction to give the parties and counsel what they need to make this happen without further involvement by this court. The only matter beyond the control of the court is a desire by both sides to accomplish this directive,” the massive ruling concludes. AquAlliance attorney Jason Flanders of Aqua Terra Aeris Law Group called the ruling an “excellent result” and said he hopes the defendants will halt the project or conduct more stringent review.